It is will be well worth your time to explore the Crab Shack Restaurant if you are in Savannah, Georgia or Tybee Island, Georgia. Check out the alligators in the photos below at the Crab Shack restaurant. You can play on the "pretend" gators and actually feed the live gators at the restaurant. 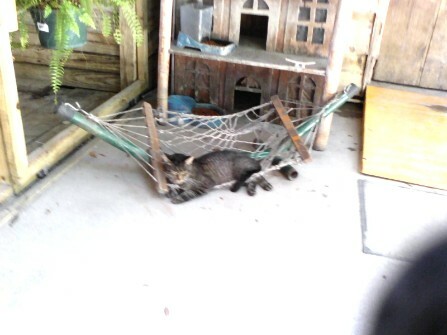 From alligators to a cat napping in a hammock are part of the unique flair of the Crab Shack restaurant and entertainment. Beach Bum Cat enjoying the southern island laid back life style. My father, Frank Suchy, enjoying the alligators. Alligator sleeping at base of light house. Live gators enjoying Tybee Island sunshine at the Crab Shack. Alligators enjoying a cool swim and a nap. The Crab Shack Gift Shop offers up some unusual residents. A Salmon Crested Moluccan Cockatoo entertains shoppers. Talking parrots greet you at the Crab Shack gift shop. An unusual decoration at the Crab Shack gift shop. Sorry, Yoda is very silent.